“There might be some big ships coming in today, so it’s important that we…” Martha’s voice was lost in the hum of speedboat nearby. What was so important? Uh… how could I have missed the most important part of the sentence? I felt like a lost child on an outing, utterly perplexed by what was going on. Martha is a member of the kayaking club Seakats Malta based in Valletta and she had volunteered to take us two tentative adventurers out to experience kayaking in Marsamxett Harbour – and Grand Harbour if we were lucky. It was 7am on a Sunday and I was feeling the strain already. I should be home in my comfortable bed and definitely not getting ready to row myself across a harbour in the mists of an early morning. We put on our safety gear of hat, sunglasses and a life jacket. I smeared sun cream on my face with the vigour of someone off to war. Needless to say I was not feeling positive about the ride. Pushing the kayak into the water was the easiest part. What I did not bargain on being so problematic was the actual physical act of getting into the kayak. I can now speak from experience when I say make sure there is another person holding your kayak as you attempt to get in. Just as the sea has a mind of its own, the kayak follows the sea blindly and must be tamed in order to ride it. And off we went. Floating across the uncharacteristically quiet harbour – just before the sun attacked us with its heat – that gave me a sense of peace after all my earlier anxiety. As I paddled along after our guide, I was suddenly seeing familiar places from my childhood years from a different perspective. Being on a kayak feels like an interesting blend of swimming and sailing. We were making our way towards Manoel Island or L’Isola del Vescovo as it was called in the past. This small piece of land is connected to the mainland by means of a bridge and is found right in the centre of Marsamxett Harbour. In the pas,t it hosted the quarantine hospital ‘Lazaretto’ which was first built in 1592 to combat the plague. The original hospital was pulled down and later a more permanent fixture was built by the Order of the Knights of St. John. Today, the hospital is still there but it bears no resemblance to its former days. The crumbling building remains part of a memory of a long forgotten past. The Lazaretto hospital is not the only remnant of the past on the island. Fort Manoel, an 18th century fortification commands another part of the small island. This was commissioned by Grandmaster Antonio Manoel de Vilhena. At first controlled by the Order it then moved into the hands of the British when it became a naval base for the Royal Army. It was bombed in 1942 and since then had been left in its post-war state. However, recently a restoration project has resurrected the once dead fortification. Before setting off I had imagined this short trip to be one of adventure, frantic rowing and extreme fatigue. I pictured myself ending the day aching with sore muscles and yet feeling great satisfaction in having exercised in novel way. But what really happened took me off guard. We passed the finish line and paddled under the odour filled bridge leading onto Gzira and made our way back to Valletta’s side of the harbour. As we moved on we came across an abandoned house standing at the water’s edge. Vegetation had gone wild as trees and moss mingled with seaweed. Creepers dangled from glass-less windows and danced around columns inside the house. There was a romantic aura to it as the waves lapped up the doorstep and sounds of birds could be heard from the trees. I sat there slightly taken aback. The quiet deterioration of the house which was once a home was something I did not expect to see there. This house had an interminable feel to it as it stood there defying the erosion of the elements. I could almost see the ghosts of its inhabitants flitting through the walls and windows. As I paddled back in silence, I could not stop thinking about the house frozen in time on the banks of our historic harbour. Perhaps there was more to this ride after all. Gone was the shouting and laughter of the group, and in its place there was silent exhaustion. We slowly paddled back to base in a straight line each of us lost in our thoughts. Kayaking always brings to mind adventure and discovery of new places. This trip ended up being a re-discovery of places we thought we knew and yet still had an element of the unknown to offer us. 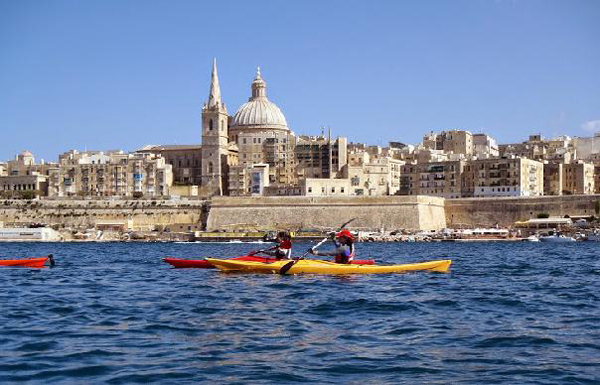 SeaKats Malta offers beginner kayaking sessions. Full details on their website and find them also on Facebook. In beginner sessions (available against a donation), you’ll be able to use club equipment and learn the technique of paddling as well as other skills. You’ll be accompanied by club members. Club Headquarters are situated in the port of Marsamxett, Valletta alongside the Sliema Ferries-Valletta landing. Elena Stilon is a Masters Student of English at the University of Malta. This post was kindly penned for us as a course assignment.